Like other advertisers, Volvo last year said no thanks to plunking down more than $4 million for a 30-second Super Bowl spot. But it didn't sit on the sidelines. Rather, the automaker crashed the game via Twitter, unleashing "The Greatest Interception Ever," a campaign that encouraged fans to tweet the hashtag #VolvoContest and enter a friend to win a Volvo XC60 during the airing of rival automakers' spots. Created by Grey New York, the effort went viral, generating 55,000 tweets using the hashtag and scoring 114,000 mentions. Over the course of the game, Volvo trended globally on social media, while the promotion yielded a 70.7 percent year-over-year increase in XC60 sales in February 2015, Volvo said. The cost for all that? Not one media dollar, according to Grey. As the price of a Super Bowl spot soars—this year hitting $5 million for 30 seconds—brands including Volvo, Esurance, Newcastle Brown Ale and Adobe are finding some creative and economical ways to get in on the action—whether via social media, a regional ad buy, or a pre- or post-game ad. Not only are they cheaper, but they also can be every bit as clever as a big-budget effort and generate even more buzz. "For a lot of brands, it's cost prohibitive to have a major role in the Super Bowl," said Brian Shembeda, evp and creative director at Leo Burnett, which created Esurance's 2014 gambit. "It just doesn't make sense to spend that money. For some brands, that's their entire marketing budget for the next three to six months. Figuring out a smarter way to get your message across means you're going to have a lot more breakthrough." In 2014, Esurance sought to "build brand recognition and trust" by way of a multipronged effort that included the first spot to air after the Super Bowl, pointed out Nancy Abraham, vp of integrated marketing communications for the company. The strategy saved the brand 30 percent, or $1.5 million—a fact that Esurance cheekily touted, passing those savings onto one lucky viewer via a sweepstakes on Twitter. The hashtag #EsuranceSave30 trended within an hour of the ad and got 5.3 million mentions and 2.6 billion social impressions globally. Such campaigns are certainly helped by evolving strategies around Super Bowl advertising. Instead of being "about the night of or the couple of days around the Super Bowl, [the work is] now something that lives online," said Andreas Dahlqvist, chief creative officer of Grey New York. "There's more anticipation about advertising, well beyond the time frame of the commercial breaks. The whole notion of changing the way people watch ads around the Super Bowl has helped these kind of initiatives actually have a chance." Another master of the ambush ad is Newcastle, which scored viral hits in both 2014 and 2015. The first effort, "If We Made It," featured actress Anna Kendrick in a hilarious, profanity-laden rant lambasting the brewer for backing out of the Super Bowl. It nabbed 10 million views and lifted brand awareness 416 percent, according to agency Droga5. As a follow-up, Newcastle bought a regional spot in Northern California. 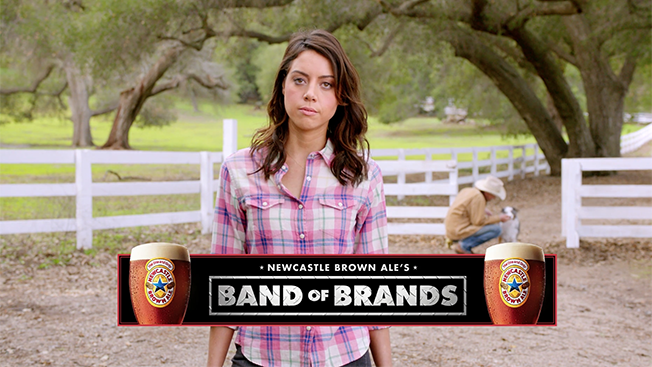 "Band of Brands" featured yet another acerbic actress, Aubrey Plaza, in a crowdfunded campaign that was supported by 37 brands—among them, Jockey, Lee Jeans and Brawny. "We thought it'd be fun to insert ourselves in the hype just like everyone else but just not pay $3.5 million or however many million for a spot," said Ted Royer, chief creative officer at Droga5. "We knew that not having the ad [in the game] would be a big PR hook. It was all about using all the avenues, all the lanes that had been created by every other brand to brag, using those as a fun way to subvert the whole thing." Goodby, Silverstein & Partners' ambush spot for Adobe, to be released today, is just the latest example of that brand finding a way in. In 2013, its "Animals" spot aired after the Super Bowl, featuring a monkey asking: "Can you believe they spend millions of dollars on these things. For what? Thirty seconds?" As attractive as reaching a Super Bowl-sized audience without the investment may sound, analysts caution that some of the more famous efforts may have been a matter of pure luck. "Ambushes done right can deliver instant fame and talk value, but the unpredictability of catching lightning in a bottle is not suited for everyone or every brand," said Eric Springer, chief creative officer at Innocean. "This doesn't mean you have to play it safe, but guaranteeing an official spot, with viewership over 115 million eyeballs, can do amazing things for any brand."